Shortly after the discovery of the particle plumes on January 6, the mission science team increased the frequency of observations, and subsequently detected additional particle plumes during the following two months. A NASA spacecraft, that will return a sample of a near-Earth asteroid named Bennu to Earth in 2023, has discovered plumes erupting from the cosmic body’s surface — among a numerous other findings including evidence of water-bearing minerals. Bennu also revealed itself to be more rugged than expected, challenging the mission team to alter its flight and sample collection plans, due to the rough terrain. Bennu is the target of NASA’s Origins, Spectral Interpretation, Resource Identification, Security-Regolith Explorer (OSIRIS-REx) mission, which began orbiting the asteroid on December 31 last year. Bennu, which is only slightly wider than the height of the Empire State Building, may contain unaltered material from the very beginning of our solar system. “The discovery of plumes is one of the biggest surprises of my scientific career,” said Dante Lauretta, OSIRIS-REx principal investigator at the University of Arizona in the US. “And the rugged terrain went against all of our predictions. Bennu is already surprising us, and our exciting journey there is just getting started,” Lauretta said. Shortly after the discovery of the particle plumes on January 6, the mission science team increased the frequency of observations, and subsequently detected additional particle plumes during the following two months. 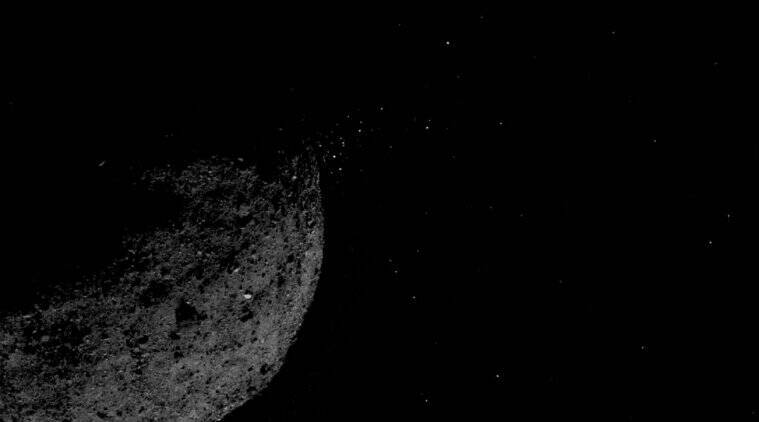 Although many of the particles were ejected clear of Bennu, the team tracked some particles that orbited Bennu as satellites before returning to the asteroid’s surface. Scientists have also discovered evidence of abundant water-bearing minerals on the surface of Bennu. Using early spectral data from NASA’s OSIRIS-REx spacecraft orbiting the asteroid, the team identified infrared properties similar to those in a type of meteorite called carbonaceous chondrites. “Scientists are interested in the composition of Bennu because similar objects may have seeded the Earth with water and organic materials,” said Victoria Hamilton, a mission co-investigator from Southwest Research Institute in the US. “OSIRIS-REx data confirm previous ground-based observations pointing to aqueously altered, hydrated minerals on the surface of the asteroid,” said Hamilton, lead author of the study published in the journal Nature Astronomy. OSIRIS-REx launched in 2016 to explore Bennu, which is the smallest body ever orbited by spacecraft. Studying Bennu will allow researchers to learn more about the origins of our solar system, the sources of water and organic molecules on Earth, the resources in near-Earth space, as well as improve our understanding of asteroids that could impact Earth. The OSIRIS-REx team also did not anticipate the number and size of boulders on Bennu’s surface. From Earth-based observations, the team expected a generally smooth surface with a few large boulders. Instead, it discovered Bennu’s entire surface is rough and dense with boulders. The higher-than-expected density of boulders means that the mission’s plans for sample collection, also known as Touch-and-Go (TAG), need to be adjusted. The original mission design was based on a sample site that is hazard-free, with an 25-metre radius. However, because of the unexpectedly rugged terrain, the team has not been able to identify a site of that size on Bennu. Instead, it has begun to identify candidate sites that are much smaller in radius. The smaller sample site footprint and the greater number of boulders will demand more accurate performance from the spacecraft during its descent to the surface than originally planned. The mission team is developing an updated approach, called Bullseye TAG, to accurately target smaller sample sites.